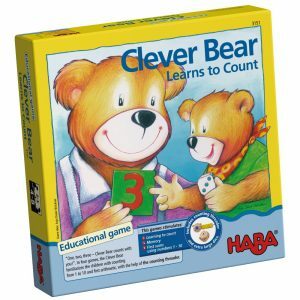 We are thrilled to have been sent a superb selection of HABA products for review. "HABA’s company philosophy is based on one simple principle: Children are the most important things in life. . Instilling fundamental values, helping them become independent and develop into creative and imaginative people is not the exclusive job of the parents; children grow up in a complex network of relationships. Siblings, friends, care-givers, teachers—they all have an influence on child development. In addition to the people in their life, the environment and the objects around them play a major role in their development from the first day on." See the entire fantastic range on the HABA website. Bags are so handy for little ones, if we go out for the day, a weekend or on holiday they can fill them up with anything they want to take and they keep everything secure. If we are going somewhere where they might get dirty or wet then you can use them to pack spare clothes along with drinks and snacks. 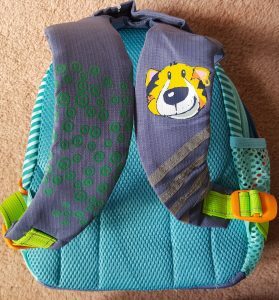 The Jungle Caboodle backpack from HABA has a fun 'big cat' design on the front and on the two straps at the back. 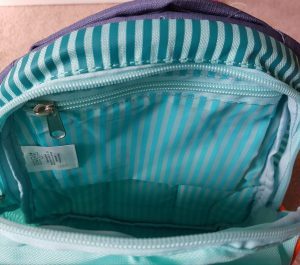 It has one large main pocket, inside this there is an additional zip pocket and another open pocket and a light blue stripe design. There is another good size pocket at the front which is well padded, inside of this there is one open pocket and two small pockets for pens or pencils. The zip on the front pocket has a cute tiger on it and the is a reflective strip at the front for safety. On one side is a mesh pocket which is great for carrying drinks as it means there is no risk of them leaking on to the inside. 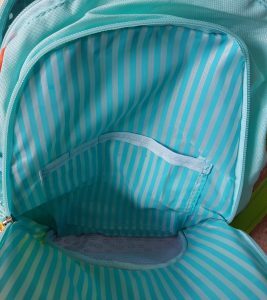 The backpack is ergonomically shaped and is padded at the back as well as having padded straps which also have reflective strips and stitching. It is a good size, it is not too big for younger ones to carry themselves but it is also big enough to actually carry useful stuff around in. 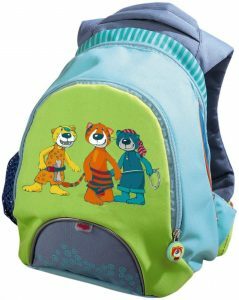 Overall it is a fantastic child's backpack with HABA's usual high quality, it has more handy pockets in it that my own bags and has a really fun design. It will be accompanying our youngest to nursery when he starts soon! To find your nearest stockist look at the HABA website. Musical toys aimed at children can occasionally be mildly annoying, need endless batteries and sometimes they don't have a volume control button. However, this gorgeous music set from HABA is nothing like that! The 12 piece set consists of percussion instruments which are mainly made from wood (from sustainable forests) and have bright and bold colours. In the set you get: A flute, drum, metallophone, 2 beaters, castanets, rainmaker, a rattling stick, a squeaking block, a tinkling block, a block with a bell and a rattling block. This set with mini versions of instruments is a great way to introduce children to music and it encourages hand eye coordination for the instruments that require them to use a beater. Each instrument is of excellent quality and has been through HABA's high standards of safety testing and solvent-free paint is used on the wooden parts. The sounds made by the instruments are of a good volume and your little one will start to learn rhythm as they experiment with all of the different sounds. The music maker is suitable for ages 2+ and you can find your local stockist on the HABA website. This is a collection of 4 games which helps younger children with first calculations and familiarising themselves with numbers between 1-10. Inside the box you get an instruction manual, 3 wooden dice (each with different ways of showing the numbers - fingers, numbers and dots), a counting threader with 10 wooden blocks on and 40 thick cardboard tiles with different pictures and numbers on. Games include a memory game but there is a bit of a twist with this as the tiles may show the number in one of four different ways; on a dice, on a counting thread, on fingers or as numbers. This encourages your child to learn different ways in which they can count and show numbers. Your child will need to try and remember where certain tiles are in order to get a match so this game is great for memory skills too. Other games include using the counting threader and the dice to secure your child's knowledge and recognition of numbers as well as a tug of war game using the threader and a basic arithmetic game. The games are all well thought out, each teaches different skills and are a great way to help teach early numbers and counting, you could also use it to make up your own games as there is scope for flexibility. You can have 2-5 players and the games are suitable for ages 4-8 but with supervision I think younger children of 3+ would be able to play. Everything in the box has the high quality you would expect from HABA products with the pieces made from sustainably managed forests and are all brightly coloured which children will enjoy playing with. Read more over on the HABA website and find your local stockist. I love this water bottle, it is bright and colourful and reminds me of glittery cups and bottles I had when I was younger! 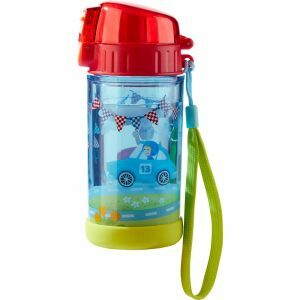 It has the popular Zippy Cars design on it with a race track and bunting and it has a special double wall filled with liquid which fills with glitter when you swirl or shake it. It has a clip down lid which has a strong hinge so it easily flips open at the push of a button and you simply push it back down to lock it. There is a handy carrying loop that can be removed if required and rather cleverly has a rubber ring at the bottom of the bottle so it doesn't slide around. The top unscrews and is easy to fill and clean due to its wide opening and it holds 250ml of water. Take a look at the bottle on the HABA website for your nearest stockist or buy from Amazon. 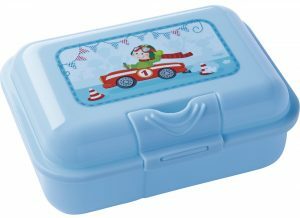 This little lunch box is perfect for younger children to keep their lunch in; there are two compartments which will keep their sandwiches separate from their other snacks or a carton of drink. The light blue colour and racing car design are really lovely and it has a little bit of a retro look about it. The lunch box is secured with an easy-to-open clasp and measures 18cm x 13cm, it is also dishwasher safe which is something that is really important to us! Like all HABA products, this lunch box is high quality and you can find your local stockist on the HABA website. Terra Kids - Children discover the world! No matter whether they do crafts indoors or play outside, carve or experiment... there are so many things to discover and experience everywhere. We are absolutely thrilled ith the products we have been sent. They are superbly made, encourage lots of children's interaction, and will really encourage children to have fun outdoors. Superlative - please do look at the whole range at the HABA /website. Not only do children have the pleasure of watching birds use their nesting box, they also get the satisfaction of building it themselves, so there are double benefits. It's so good to see children being creative, especially in our electronic world, and they ill increase their dexterity and creative skills with this kit. The plywood set consists of 17 pieces to glue together; the kit is easy to use and the pieces are pre-cut and simply push out, but adult help may well be appreciated, and it's a good opportunity to work together. The instruction book is very informative, including instructions on painting and siting. The completed box measures 23 x 15 x 31 cm and there is a door at the front that can be opened for cleaning - but do emphasise to your child that they can watch the occupants from a distance but they must not be disturbed. Building the box will be great fun - and it could be painted or varnished too, to make it totally personal and last longer - and it's the perfect way to encourage children to take an interest in nature. The fun of assembly and the fun of playing - double the fun! Simple to assemble in just a few easy steps this colourful glider is robustly made of polystyrene and will withstand a few crash landings - although it has to be remembered they always happen with gliders. However, this glider is far more durable than many we have had, so it's a great buy. It simply slots together, and there are two pages of colourful stickers so the lucky owner can really make the glider their own This glider has outstanding aerodynamics - it really flies well and accurately. A well made toy, ideal to encourage children to play outside. Find stockists on the HABA website. This traditional wooden plant press allows children to easily press leaves and plants and it includes five insert papers. It's a neat compact item, which is lightweight and perfect for taking out and about when enjoying and discovering nature. Flowers, leaves, grasses... everything that children collect on their forays into nature can be pressed and preserved in this plant press. With 5 insert papers and practical drawstring closure it's easy to carry and use. Remember to remind children to be careful what they pick, and never uproot a plant, or pick a rare flower. Just take what you need and make sure there are plenty of other plants and flowers left. Pressing leaves is ideal, and autumn leaves can be used to make some excellent collages. The press is really easy to use - just release the strap, insert the items to be pressed between the pages (I think it ill work even better if you use blotting paper, kitchen roll or something else absorbent), then the strap can be tightened to the requisite level. As the items dry, it's easy to re-tighten for good results. It wwould be good if there were instructions included, but it is fairly intuitive. A well made and easy to use flower press, which will encourage creativity and an interest in nature. See the HABA website for stockists. I was blown away when I unpacked this - such a superb product and ideal for helping children encourage wildlife. Wherever you live, you will be able to find a wall or fence, and start doing your bit for nature. Perfect for schools too. This self-assembly insect hotel comes with seven indivudual 'rooms' for children to fill with appropriate materials to encourage insects to make them their home. The individual "rooms" can be filled with twigs, straw, clay, snail shells or other items found in nature, or items from house and garden including small canes cardboard. I love the fact children can collect their own contents, giving them a real sense of ownership. On a practical level, the kit comes with a plastic roof, to protect it from rain. For extra durabiliry and to make it even more attractive, we intend to paint ours with insect-safe external wood paint. An instruction booklet is included with hints for suitable sites. The kit is recommended for ages 6 and up, but some adult input will be required - a lovely project to work on together. Children will learn construction skills and how to follow instructions, and have the satisfaction of a worthwhile and usable piece of kit at the end. The box is made of 4 mm plywood (26 pieces to glue together), plastic and polyester and the assembled insect hotel measures 25,5 x w 21,5 x h 22,5 cm. There are 4 - 6 little trunks with drilled holes, 1 roof, 2 belt straps, clay, wood glue and a set of instructions. It all fits together well with the individual pieces neatly pushing out from the frames before slotting together; the pictorial instructions are straightforward. A brilliant way to encourage wildlife; to help children see how important it is; and a great way to learn construction skills. Children can enjoy traditional marble games indoors and outdoors with this colourful set. With its neat string bag, it's great for travel too. The pack includes instructions for game ideas inside and outdoors and there are 22 colourful glass marbles for the games - black, orange, green and white. For the volcano game, choose how far from the volcano each player wants to be - this allows adaptability for children of different ages/skills. There are three approaches to the volcano which offer different challenges. The winner is the first to get their marbles in - three marbles equals one white marble; two white marbles and you've won. Other games are Barrier and Boule - and there's plenty of scope for children to use the marbles for other games, perhaps introducing other elements from around the house and garden. make a zigzag alleyway with sticks; set up a mini obstacle course; blow the marbles along a smooth surface... Lots of potential and a nicely made product that will give hours of gentle traditional fun, helping to improve dexterity and imagination.. Encourage children to explore our natural world with this extremely lightweight and easy to take along magnifying carousel. Children will be fascinated to see everyday creatures larger than life. It's a practically designed piece of kit that will make children feel like real explorers with its aluminum snap link for hooking on to backpack or Terra Kids Explorer's belt. The set includes a rotating magnifying glass and six containers and it is all neatly packaged into a mesh bag with a draw string. To look at their discoveries, children need to collect insects or other natural items and store them in the containers. The containers simply slot out for filling; once replaced, the magnifying glass swivels around so the objects can be examined. When not in use, the magnifying glass slots flat. It's a really nicely designed piece of kit which works effectively to encourage children's love for discovery. Remember to remind children to only keep the creatures for the minimum time possible to look at them, and then release them. Simple to use and effective, this is a lovely way to introduce children to the world of magnification, and to show them how amazing things are when magnified. It can be used indoors too - plenty of things around the house that can be examined. At KS2, children will be encouraged to make and record their own scientific discoveries, and this is an excellent way to support that. This lovely multi-piece playset is suitable for children 18 months up - it's always great to find toys recommended for this age group. Made from solid beech wood and attractively painted, young ones will love to help farmers Adam and Molly look after all the animals on the farm. There's a farmhouse, of course, plus a horse, a pig, a cow, a calf, a sheep, a goat, a dog, a manger, three fences, a pitchfork, a bucket and a milk churn. The animals all look really friendly, with happy expressions that will appeal to children The farmhouse is prettily decorated, with charming touches like a line of washing and pretty flowers; it assembles easily with a slot-together system and is very solid once made. This is a really high quality product which is well designed, with rounded edges to most of the pieces, and no sharp corners. All the pieces stand up well and offer lots of opportunities for imaginative play; with the variety of pieces, children will find plenty of stimulation to act out stories. 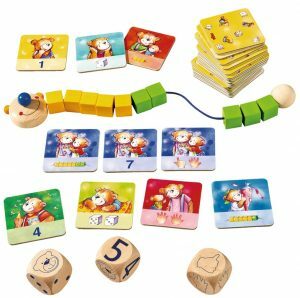 The set can also be extended by using other sets in the HABA Playworld series - find out more here. This is a lovely toy which will look good displayed in a child's room when it is not in use. Wooden toys are a great favourite of mine as their appeal is timeless and then can be passed down within and beyond the family, giving pleasure to many generations. It's a super way to teach children about life on the farm and to use to start discussing where our food comes from. Toddlers will love the range of sounds produced by these colourful blocks. There are six discovery blocks and all but one offer different acoustic effects; the final one has a ridged tactile effect. It's a great way for toddlers to explore the world of sounds, with squeakers and rattles that require the child to make different movements with the blocks, such as twisting or pressing, to generate the sounds. The brightly coloured beech wood blocks can also be used to build a tower - each cube is 4 x 4 x 4 cm. They are beautifully made, with rounded edges and lots of shapes to explore. A lovely toy for children who are starting to investigate the world. This is a beautifully made attractive wooden toy which is perfect for learning numbers 1 to 5 as well as colours. It also encourages fine motor skills and concentration as children (recommended age 2+) use the magnetic pen to move the balls around the maze. Usefully, the attached magnet wand (no danger of losing it!) tucks safely away in a convenient storage slot inside of the maze - the whole game is really well designed and it's perfect for taking out and about. Based around five animal friends (pig, cow, sheep, pig and hens), there are 15 colourful balls to match up with the corresponding animals and numbers. For example, the five white balls turn into chicken eggs in the nest. For added challenge, there are maze dividers that can also be moved around with the magnetic wand. The toy is totally safe, as all the parts are enclosed withing the wood and perspex outer. Made of lime plywood, this colourful toy measures 23 cm diameter x 3.6 cm deep. Adults - have a play with it first because your child won't want to part with it; I found it quite addictive and very relaxing. A real joy of a toy which is superbly made and which develops a range of key early learning skills while children are having fun. HABA pay a great deal of attention to safety - products comply with European and national regulations for toy safety for both materials used and their processing. They comply with the European toy safety directive (2009/48/EG) and the EU directive on general product safety (2001/95/EG), as well as the EU standard for toy safety (EN 71). This wooden clutching toy is painted with bold eye-catching colours. It makes a very gentle clacking noise when played with saliva resistant. The wooden balls are moveable, thanks to the strong elastic band which holds the whole toy together. Each half-ball is painted a different colour which still allows the attractive wood grain to show through. The toy is made of beech wood. It has a lovely feel - very tactile. It's a simple toy but one that will give a baby hours of pleasure. Dimensions - radius 9 cm, with 12 half balls. What has really struck me, as well as the high manufacturing standards, are the bright vibrant colours used throughout the HABA range - these are perfect to capture children's attention and make the toys so attractive to look at and to have on display in a child's room. These 72 multicoloured wooden beads epitomise these values perfectly. The variety of shapes is excellent, including big and little cones and cylinders large and small. The pack also includes threader and cord; the holes are just the right size for a three year old and this toy will really develop fine motor skills and hand-eye coordination. Young children will just enjoy the threading; older ones may well design necklaces, bracelets and belts to their own taste. The beads can also be used to teach about pattern, laying the beads out and asking children to copy the order, for example. Beads are made from beech wood and painted with a nontoxic, water-based stain. Like all HABA toys, this is made in Germany.